This is Z Life: Snow, Beautiful Snow! 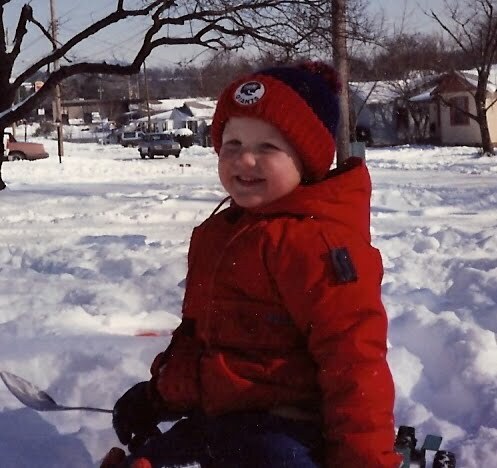 Here's another "wayback" snow picture in honor of our snowfall here in central Arkansas. Here's my little boy digging in the snow with a big spoon. I remember he had his Tonka dump truck and had so much much fun "excavating" in the snow. What a difference time makes. My boy called me last night and told me he and some friends are going sledding this morning on a hill where his friend says they can get up to about 45 miles an hour. Is that possible sledding down a big hill? I don't think I want to know. Snow is fun for us in this area of the country because it's so rare. It's a magical event. During the five years I lived in Kansas as a young bride, snow lost its magic for me because it was a part of daily life from November to spring. I remember the first day it snowed when I began teaching at Cessna Elementary in Wichita. Outside my classroom window that morning huge snowflakes began falling fast and furiously. As they continued to fall and the snow began spreading a thick, soft blanket on the ground, I waited for the principal to get on the intercom and tell us that school was being dismissed. It didn't happen. It snowed all day. School was dismissed at four o'clock. I trudged through the drifts, struggling to keep my balance. I remember using a broom to sweep the snow off my car. I don't even remember where I got the broom. I'm sure a co-worker had compassion on the naive, young teacher from the south. I finally got settled in my car and slowly started across the parking lot, only to lose control and began sliding dangerously. I remember that when I got stopped I burst into tears and said aloud to the empty car, "I don't know how to drive in this stuff." Somehow I made it home that day, and over the course of the next few months I learned to drive in that "stuff." When John was a toddler, I ran a home preschool program out of our house. Tim traveled on business most of the week, and I was home alone with a house full of kids. Couldn't get out. Too many kids for one car, and the weather was bad so much of the winter. We had a chunk of ice in a shady area in our front yard that stayed there from about Thanksgiving until the following spring. I would look out and see that ice and wonder if spring would ever come. To those of you here in central Arkansas, I hope you make some wonderful memories in the snow today. Or, if you prefer, just curl up with a good book and have a cozy day as you look out at the magical white world.